Vape shops per 100,000 residents. Which state has the highest concentration of b&m vape shops? Clearly it should be one of the western states, where vapenerd culture is rampant. But which one? Quartz.com was wondering the same thing and so they went to the most reliable source for info about physical stores, Yelp, and compiled the data in an effort to find out which state takes the title for most vape shops per capita. 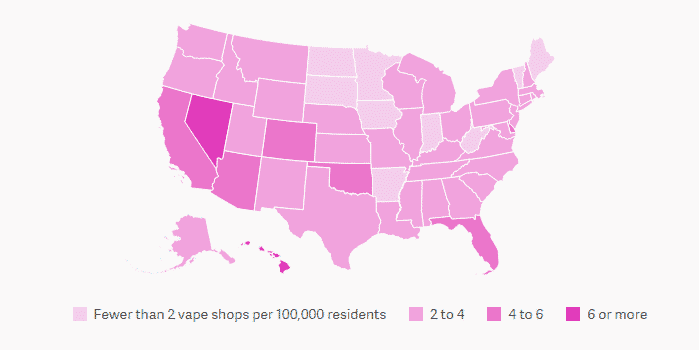 The winner was VaporVanity’s home state of Nevada, with 6.7 vape shops per 100,000 residents. Most vape shops are concentrated in the heavily populated Las Vegas metro area, where, as I can personally verify, you can’t even drive five minutes to a grocery store without seeing 20 different vape shops. Coming in at #2 is Hawaii, the only other state with more than 6 shops per 100,000 residents. The remaining top five states are Oklahoma, Florida, and California. More fun data from Yelp shows that there are 10,591 vape shops in the country. That’s 2.7 vape shops for every bowling alley and 4 for every comic book store. The data also shows the devastating impact that statewide vaping regulations has on businesses. Four of the lowest ranking states – Arkansas, Indiana, Iowa, and Wisconsin – require a license for over-the-counter sales of electronic cigarettes. The states with the highest concentration of vape shops are states where the government hasn’t interfered with ridiculous anti-business pro-taxation regulations. If nationwide regulations are passed, the vape industry in the whole country would be just as bad as it currently is in Arkansas.